Flat or duplex, 1 Bedrooms, 1 Bathrooms, (Sleeps 2). Papamoa Beach is in the top 10 best beaches in New Zealand. The white sand and pristine long stretch of coastline is a popular destination for holidaymakers. Where the Beach House is located is a hidden treasure. The beach is 300 meters in either direction. 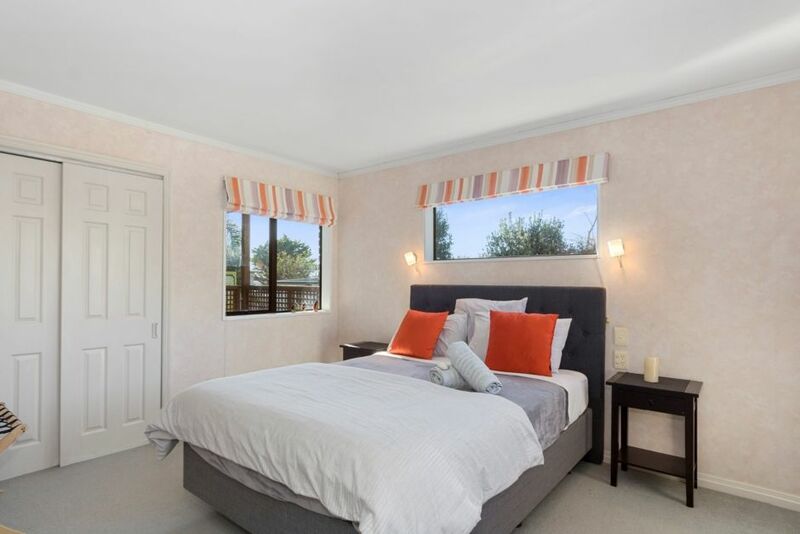 There are many amenities close including a small supermarket, a number of takeaway restaurants (Indian, Turkish, Chinese, Fish and Chips) a great local pub you can walk to plus Fashion Island is 5kms away. This is a great base if you are attending a wedding, family event, Jazz Festival, Arts Festival or if you are just having a look around or a beach break. We live upstairs and you may hear us coming and going but we are very respectful of our guests. We are happy to help with any tips of what to see in our area, what is on and how to get there. Included is a George Forman grill, waffle maker and microwave. There is no oven access. Two choices of cereals, bread, spreads and fresh milk is offered. Tea, coffee and filter coffee are supplied. Enjoy breakfast on the patio or in the garden. Papamoa East is 20kms from Tauranga city, 16kms from Mt Maunganui and 70kms from Whakatane and 60kms from Rotorua. Pap Beach House is most suitable for quiet living, non smoking couples or solo travellers wanting safe, clean, modern, private, well equipped accommodation in a garden setting. The bathroom and toilet are all new and the gas water pressure is amazing. There is a laundry and outside undercover washing line. We have a portacot and high chair for quests with a baby but the property is not suitable for toddlers or children or pets. There is off street parking for one vehicle only. This property is not suitable for entertaining. Preference is given to guests with a positive review history with Bookabach. Extras: Cleaning (Required, NZ$50.00 per stay); Good quality linen is provided. We would consider month long stays by negotiation. I have lived in Tauranga for 20 years and consider myself a bit of a beach bum. We have always enjoyed the local beaches but Papamoa Beach attracted us here 6 years ago. The beach is safe, not too popular, good fishing and surfing and has the most stunning sunrises and sunsets. I want to offer an away from home for visitors to enjoy our local area and have a comfortable place to toss their shoes off and relax. A beach house we never thought we would have. High quality bedding and linen. Brand new bathroom. The most amazing hosts and location! A dream vacation come true. Trudy & Reinhard (Rye) S.
Thank you New Zealand! Fell in love with the people, the country and plan to come back. And we would welcome you back. Ka kite ano Rye and Trudy. The cottage is the downstairs space in their home with separate entrance and facilities so guests are utilising a fully self contained apartment. It was spotlessly clean well stocked and everything worked. Separate dining, kitchen and lounge areas give the place a spacious feel. The shower pressure is fantastic! The bed is comfortable. Handy access to beach and there’s a small shopping area close by with a good Indian restaurant too. Great location to explore from. Cosy accommodation. Thanks!